I did preschool storytime for a packed house earlier this week and it was a great crowd for Construction storytime! I had done a construction storytime theme previously, and there are so many great books to choose from that I chose all new ones. When I do storytimes in the summer, I make sure to mention that children of all age can do the Summer Reading Club and earn prizes. I also grab some of our paper reading logs and encourage families to take them. Ideally they will create their online account and sign up, but if it's easier for them to keep track on paper we can catch them when they come in to collect prizes and have them make their account. Book: Tap, Tap, Bang, Bang by Emma Garcia (Boxer Books, 2010). This book has such fun sounds and bright, colorful pictures. 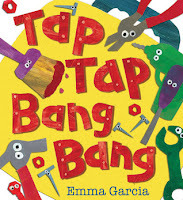 Garcia puts a sound effect with each tool and she includes basic tools like a hammer and a screwdriver and also some that kids may not be familiar with like a vise and a level. This is a great storytime choice for including vocabulary words and it has a great rhythm and word sounds to it, which help kids hear that words are made up of smaller sounds. I used my prop and had the children hold up their fingers as their "five little nails" and use their fist as a hammer to gently hit the nails in. Some were able to join in on most of the rhyme as we kept repeating and everyone LOVED shouting out "Bam, bam, bam!" together. This rhyme helps children practice counting down and it exposes them to rhyming words, which help them hear that words are made up of smaller sounds. Book: Billions of Bricks by Kurt Cyrus (Henry Holt, 2016). As soon as I saw this book last year, I knew I wanted to use it for a program during our Build a Better World Summer Reading Club. It has a really great rhythm and rhyming words and uses a lot of great vocabulary words. 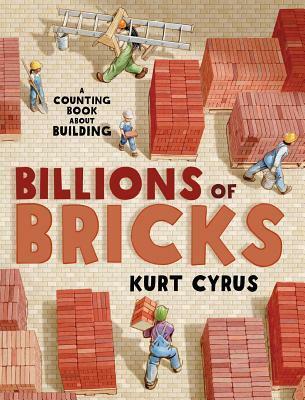 Before I started reading it, we talked about the word "Billions" and whether it meant just a few things or a lot of things. The complete text was maybe a tiny bit long for my group and I would probably shorten it a few spreads if I did it again for this age group. I think this would also work well with school age kids, particularly in conjunction with any kind of building or engineering program. Because I was doing this with a preschool audience and we definitely had some wiggles to get out, I had everyone stand and bounce or jump along. After we did this once, we did it again SLOW (like we were carrying a reeeeally heavy load!) and then FAST (like the dump truck was empty and we were whizzing down the street!). 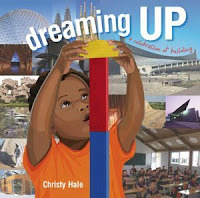 Book: Dreaming Up by Christy Hale (Lee & Low, 2012). So, I ended up skipping this one because I had a huge crowd and although I love this book I wasn't sure it would hold their attention for long enough. Featuring a diverse cast of kids, each spread shows children building or creating and then a photo of a real architectural structure in the same style. It has a lot of interesting illustrations that would be fun to talk to kids about. This is another one that I think would work with older kids, too. I just had too many squirrelly kids for two books at the end and I thought Rex would hold their attention better. 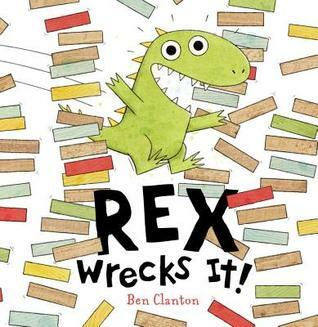 Book: Rex Wrecks It by Ben Clanton (Candlewick, 2014). When his friends build creations, guess what Rex does? That's right - he WRECKS THEM. Until, that is, they all discover that they can have more fun working together. This is a fun story about something that's familiar to kids - it's fun to wreck the things you've built with blocks and it can be very tempting to knock over others' creations, too. We talked a bit about emotions with this book - how do Rex's friends feel when he wrecks their buildings? How does Rex feel when they build without him? Talking about and identifying emotions helps children start to learn how to regulate their own emotions. Pointing out these talking moments in storytime helps model for parents how they can use books to start these conversations. We got out lots of building stations this week! I always get out our wooden blocks. Today I put out shapes on the felt board for kids to "build", Duplo Legos, and two of our previous Engineering Table activities (building with pool noodles and the Billy Goats Gruff set from Lakeshore Learning). This form of twine makes it difficult to handle without the right tools. you will want an expert to return and installation the corner and bracing to get the great out it. They should additionally set up fence posts in a way with a view to take advantage of the strengths of this fence correctly check that.